Here at Mortech, we're constantly making improvements and coming up with new ways to make Marksman the best mortgage pricing engine available for you. With so many different improvements and new features coming up as fast as we can make them happen, we thought we might share a few things with you that we think you might not know about our mortgage pricing engine. If you are pricing BPMI, we will use best ex pricing between the MI companies you have added in your account. Once the scenario has been run, you can navigate to the ‘Base Info’ tab, which will show you both the premium and estimated monthly amount based on the specific loan scenario you have entered. 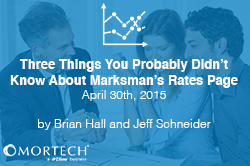 Did you know that every time you login to Marksman you could have different defaults on the rates page? You can! Take a look at ‘settings’ > ‘user settings’ and update. While you’re there, make sure your contact information, position, and NMLS are also current. Want to include a specific rebate amount in your pricing for a loan scenario? You can enter a rebate as either a dollar amount or a percentage and Marksman will calculate that amount into your rate and price. The rebate field is located in the bottom left side of the ‘Loan Criteria’ tab on the Rates page. Want to know more? Schedule a free, consultative demo today and start using these and other features to post accurate rates to more people, all with the speed and ease of our automated system.